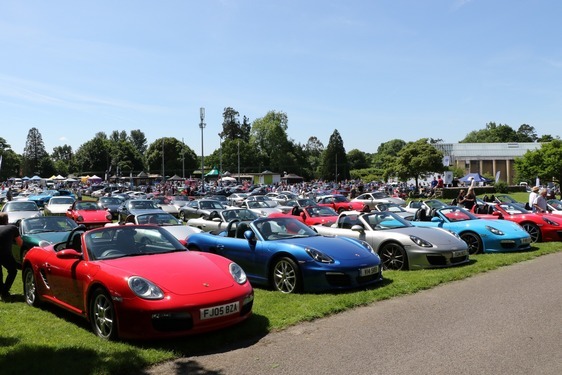 As the name suggests, Simply Porsche, was simply Porsche with a 60% increase on the previous year and nearly 1600 Porsches descending on the National Motor Museum at Beaulieu on the 3rd June. With the unexpected increase there were some delays in getting in but from personal experience handled with good humour by everyone allowing plenty of time to view many cars meandering into the arenas. Having waited 25 years to own a Porsche, reality came in March 2017 with a silver 911 Carrera 2 Tiptronic (996) being purchased from Chris at Pie Performance, and this June saw it make its way to be a part of this impressive gathering of likeminded owners, with all models catered for (Like Pie Performance with their facilities!) from the very earliest to 2018 plate cars. Panic set in as just before the main event the tensioner failed – RAC Recovery to Pie and it was quickly sorted so no issues thankfully! The first time I was at Beaulieu they had a steam train on display which apparently left there in 1972, and a kids’ self-drive car track – I adored cars even back then. The main areas, despite their very large size just did not have the capacity to display every car, despite filling every nook and cranny, and the ‘reserve field’ behind the bank was full of from the front to back areas with an equally very impressive array of cars. 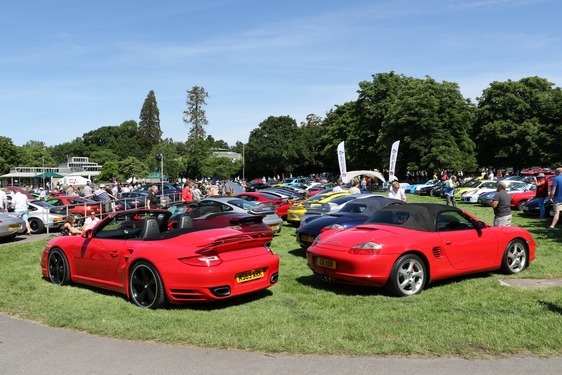 As expected Clubs were well represented, with TIPEC playing a large part in the organisation, along with a display from Porsche Club GB, the 996 Owners Facebook Group, and many others. If this wasn’t enough, a large stand with the latest models from Porsche Cars Great Britain, Brookspeed, Car Tours, Pictures, Parts, Meguiars, Autoglym and more. Due to the excellent weather and very photogenic surroundings, any budding photographer and car fanatic would have been in their element, however if photography was not ‘their scene’, Darren Woolway was on hand taking professional photos as each car was on the way in with mounted pictures available later in the day. No display of cars would be complete without a competition and Simply Porsche was no exception – for a team of Judges to score 1600 cars would be impossible and so it was down to people’s choice. Everyone was given a voting slip and encouraged to pick their favourite. The top three were lined up in front of the National Motor Museum with the overall winner being Matt Gough from Maidstone in his stunning blue 2010 Boxster, with Neil Richardson Runner up in his gleaming red 996 Turbo, and in third place Jon Devereux with his immaculate silver 1952 Porsche 356 Cabriolet. From a personal perspective it was thrilling to see a 996 placed so highly out of the 1600 vehicles in the arenas. All in all a superb day with matching weather, and a collection of what can only be described as Stuttgart’s finest - even when departing the distinctive ‘notes’ from the engines only added to the experience and the discounted entrance fee was also much appreciated by all. So work permitting, I am looking forward to next year and hopefully joining one of the many convoys which made their way on the Sunday morning to Beauilieu, and maybe if Pie Performance will have me, exhibiting the 911 on their stand – hint hint?